Our class photo's are now split between Infants/Primary and Secondary modern. Click the links above to go to the appropriate page. Here's our latest class photograph. With help from David Henshaw and Brian Williamson, Brian has recalled most of the names. Can you help recall the rest? Middle row standing - JColin Hargreives, Victor Voller, Lee Heron, Billy Cooper, David Henshaw, Tony Wilson, Norman Hall, Barry Ingam, Stephen Meadows, David Byrom, Peter Casey, Charlie Potter, ? , Brian Tregilgas. 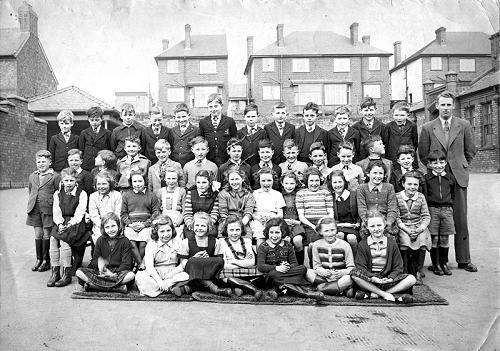 Middle row seated - Margaret Robinson, Julie Whitaker, Hannah (?) ? , Barbara Stead , Ruth Page, Janet Turner, Pamela Johnston, Janet Paine, Elsie McGee, Jane (?) ? , Iola Evans, Susan Cadigan. Front row - Doreen Fisher, ? , Mavis Tucker, Heather Hamilton, Wendy Bell, Pauline Evans, Pamela Fryer.